5 out of 5 suns because stars aren’t enough. I fell in love with this book. It’s easily my favorite book of 2015, possibly of all time. IGYTS (since i’m too lazy to write out the whole thing out) is a YA, contemporary read which i thoroughly enjoyed. It’s based on twins, a boy and girl, named Noah and Jude. Growing up, they were inseparable until a tragedy drives them apart. That is pretty much what the blurb contains and it just does not do the book justice. IGYTS is so much more. Its a gracious book that explores love, grief and self discovery as well as many other complications of life. It is truly a powerful story and you must pick it up. Highly recommended. Each chapter is told from the perspective of either Jude or Noah. Noah tells the story as a 13-14 year old while Jude tells the story at the age of 16 and it switches back and forth throughout the book. (It might confuse you at first but push through, you’ll adjust) I loved the alternating perspective and timeline since it all connected in the end, it’s great. This book will literally answer questions you didn’t even realize you were asking. Jandy Nelson gives so much life to her characters, it’s unbelievable. I loved every single character in this book who all had great character development and usually, i tend to lean over to a certain narrator when books are told from different POV’s but it wasn’t the case for this book. I loved the love interests sososo much and i don’t know, it’s hard to review such an amazing book. I flew through it. Jandy Nelson’s writing is phenomenal. Before i read IGYTS, my expectations were sososo high and they were reached. I feared i was going to be disappointed as there was so much hype around it but Jandy Nelson is incredibly talented and her writing is angelic, unmatched and so colourful. Everything she touches turns to gold. This book gave the word beautiful a whole new definition. This book isn’t about art. It is art. 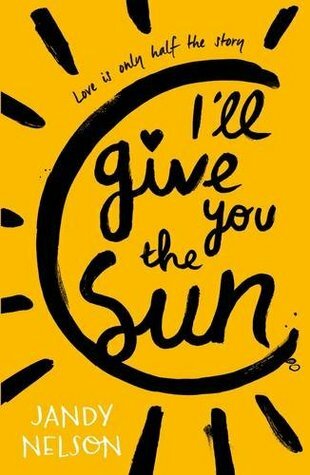 Check out I’ll Give You the Sun on goodreads! And that is my first ever review done! If there’s anything you felt like i missed or something you think i should add please leave any feedback in the comments. I’d appreciate it so much! Posted on May 4, 2015 May 9, 2015 by manyreads	This entry was posted in Book Review, I'll Give You the Sun. Bookmark the permalink. I NEED to read this book! I’ve heard only fantastic things about Jandy Nelson’s books and your review has just put her books even higher up my TBR list! This one looks good. I should check it out. This is my favorite book of 2015 and definitely one of my favorites of all time! So glad you liked it! Congrats on your first review! You’re off to a much better start than I was 😉 I have read The Sky is Everywhere and really disliked it, but I need to pick this one up! Haha, thank you!! Aww, that’s a shame! What was it that you didn’t like? I hope you’re not put off Jandy Nelson because I’ll Give You the Sun is incredible! It sounds like at some point I’m going to end up crying. Am I right? Nice review! Thanks! Haha, correct. I cried but only from happiness but this book does make your heart awfully ache!